I adapted this recipe from the cookbook based on one of my favorite documentaries, Forks Over Knives. Watching Forks Over Knives made a huge impact on my life, my diet and the way I counsel my clients and patients. I mostly give out general recommendations and tips on this blog and don’t talk much about my personal diet on here, but I promise guys, I do practice what I preach. I follow a plant-based diet, meaning that I plan my meals around– you guessed it— fruits, vegetables and whole grains. I throw in some sustainable fish once or twice a week and don’t buy meat to make at home unless it’s for something really special (like keeping with my families tradition of making sauerkraut and pork on New Years Day). I will eat meat if I’m at a restaurant that specializes in something really delicious or I’m a guest in someones home. It evens out to about once every week and I try my best to make sure the restaurant is serving local, grass-fed, non-GMO or organic meats. I’m not as extreme as FOK suggests you go, as I still find that there are benefits to including whole dairy in your diet and I just don’t want to live in a world without Greek yogurt or cheese. At first, it feels really overwhelming to consider taking meat completely out of your diet. I had no idea how to plan a dinner meal that wasn’t centered around the meat. Following a plant-based diet forced me to become creative in the kitchen, experiment with ingredients I’d never heard of, start growing my own fresh herbs and spices and exploring cuisines from other cultures like Thai and Indian, who often base flavorful meals around plant-based foods. Over the past two years, I’ve learned to focus on the things to INCLUDE in my diet instead of things I need to exclude. In other news, this was my first meal at my new dining room table! (Photos to come– the new apartment is still a bit of a mess and I don’t have a desk to work from yet so most of my office stuff is living on the new dining room table at the moment). I’m one week in to living in The Woodlands and I’m so surprised that I don’t miss Dallas at all yet. It’s so green here, there are flowers in bloom and it’s been much warmer. It has rained most days but for some reason I don’t mind it since I haven’t been around rain much lately. The birds are chirp-chirping and loving it. 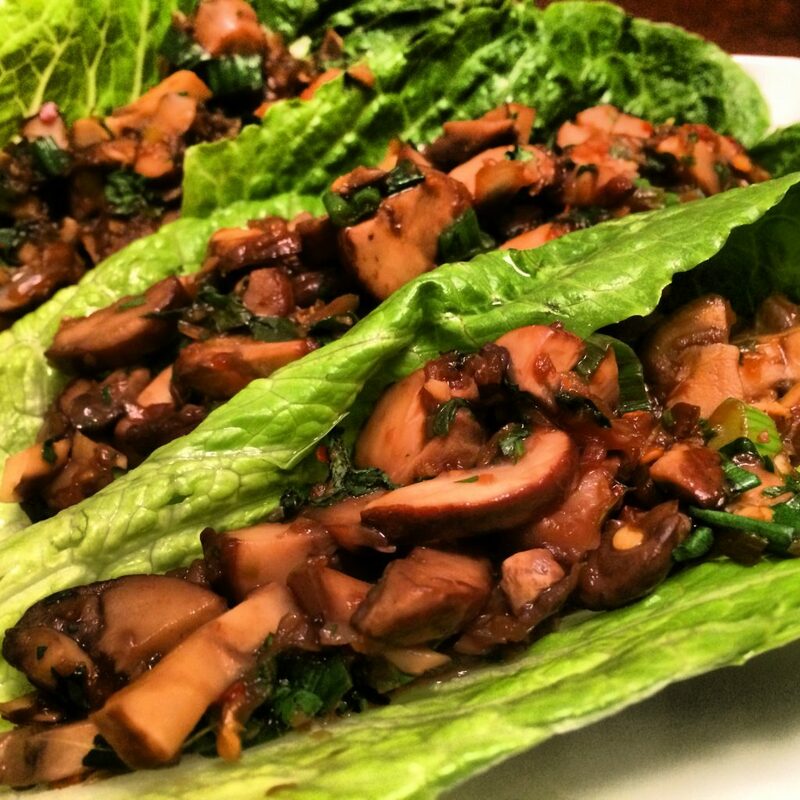 Hopefully that means spring will be here to stay very soon and hopefully you enjoy these Spicy Thai Lettuce Wraps as much as I did! Make Your Own KIND Bars… The Easy Way!